Tennis now has its own Ryder Cup-style team tournament, and two of the sport’s greatest players have signed on to play for Europe’s team. The best tennis players from Europe and the rest of the world will compete in a Ryder Cup-style competition beginning next year, and two of the sport’s most popular figures have already signed on. At a press conference Wednesday in New York, Roger Federer and Rafael Nadal announced that they have committed to playing for Europe in the Laver Cup. Federer, who dropped out of this year’s Olympics and U.S. Open following knee surgery, is ranked fourth in the world. Nadal, a 2016 gold medalist in Rio, is No. 5. The two players have won a combined 31 Grand Slam tournaments. Bjorn Borg, considered one of the all-time great tennis players, will serve as Europe’s captain. The international squad, The World, will be coached by American tennis legend John McEnroe. The team tournament is named after Australian Rod Laver, who has 11 major titles to his credit. Organizers say the Laver Cup was inspired by golf’s Ryder Cup, an 89-year-old event that puts a team of U.S. golfers up against their European counterparts. Federer and TEAM8, the management company he founded, created the concept of the Laver Cup to honor Laver and “bring a new dimension to the tennis calendar.” Tennis Australia and Jorge Paulo Lemann, a co-founder of the Brazilian private-equity firm 3G Capital, are also backing the Laver Cup. “You’re going to have Europe playing as a team against the rest of the world. I think that has to be a new feeling for all the top players around the world,” Laver said. Europe and The World will each feature six players on their rosters. Borg and McEnroe will name two players to their squads, while the remaining four will automatically qualify based on their ATP rankings. Novak Djokovic and Andy Murray, the No. 1 and No. 2 players in the world, respectively, were mentioned as potential picks for Team Europe. McEnroe said players like Canadian Milos Raonic and Argentinian Juan Martin del Potro could help The World close the gap with a talented European team. The inaugural Laver Cup will be played Sept. 22-24, 2017, at the O2 Arena in Prague. Future Laver Cups will rotate between major cities across the globe. The three-day Laver Cup will be scheduled two weeks after the U.S. Open each year, except for Summer Olympic years. 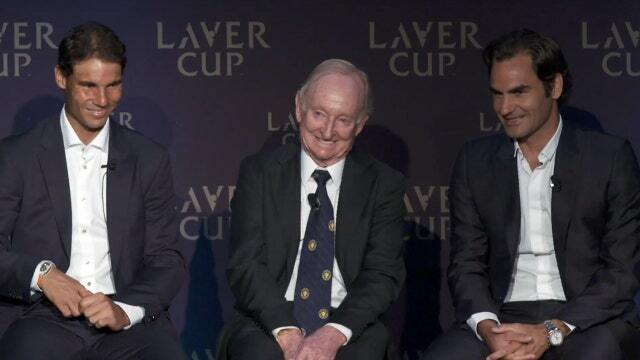 Federer said the Laver Cup should have no trouble convincing players to join the event with star-studded names already on board. Could Video Gaming Become The Next Olympic Sport? The five-time U.S. Open champion, who hopes to play in the Australian Open in January, is looking forward to playing alongside some of his top rivals on the court. “I think it’s going to be absolutely unbelievable to be on the same side of the net as Rafa—finally,” Federer said with a laugh. The Laver Cup will feature singles and doubles matches with a total of four matches played daily. Matches will be best of three sets, and each player will be required to play at least one singles match during the tournament. Each match will be worth one point on the first day, two points on the second day and three points on the last day.